Each year Keller & Keller works with local builders and community leaders to provide a fully-customized home to meet the needs of an Indiana resident with physical disabilities. The goal of Samantha's House is simple: to make everyday life more manageable for a person in need. The president of Samantha's House, Jim Keller, has recently worked to increase the organization's reach by donating a fully-customized van to an Indiana resident with disabilities. If you wish to learn more about the past recipients; listen to Q95 interview Keller & Keller about the foundation; want more information about becoming involved; or view pictures of our fundraising efforts, you can do so by visiting the Samantha's House website. 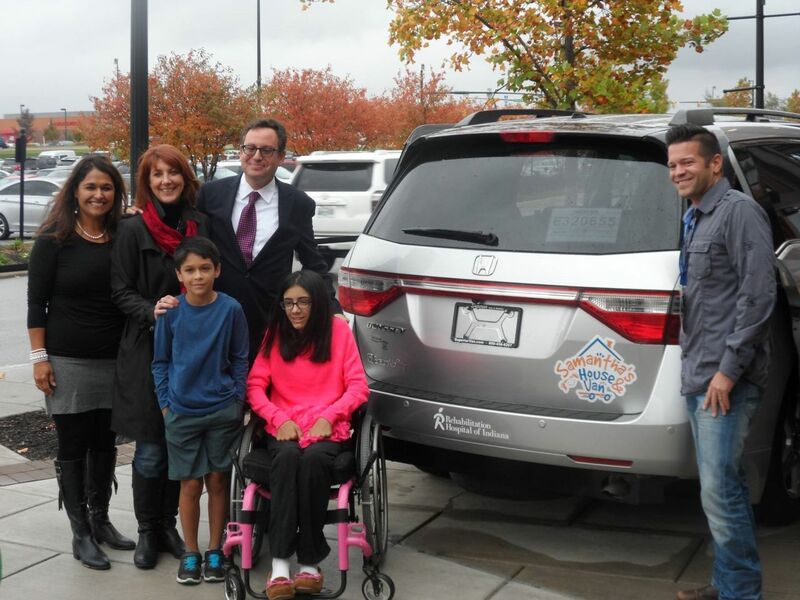 Daily mobility will be much easier for Isabel Carter and her 14-year-old daughter, Mia, after receiving a wheelchair accessible minivan made possible by the support of the Samantha's House Foundation and several participating sponsors. Mia’s life changed on Thanksgiving morning in 2013 when she woke up with severe pain in her back. Doctors determined that a blood clot had compressed her spine, leaving her paralyzed from the waist down with two partially collapsed lungs. Mia is working hard to regain strength in her legs and arms. The van will allow her to get in and out of the van without having to leave her wheelchair, making travel easier for her and her mother. To learn more about Mia's story, please visit the Mia Strong Fundraiser page. While attending the Indianapolis FDIC convention we were introduced to a manufacturer of spreader rescue tools that were being touted as "top of the line" by emergency rescue workers. Having worked several car accident cases in which our clients were trapped inside a vehicle, we understand the absolute importance of these tools and the role they play when seconds can mean the difference between life and death. In the weeks following the convention, we learned that the Bloomington Fire Department was in need of a new spreader tool, similar to the one we had recently seen on display and in action at FDIC. 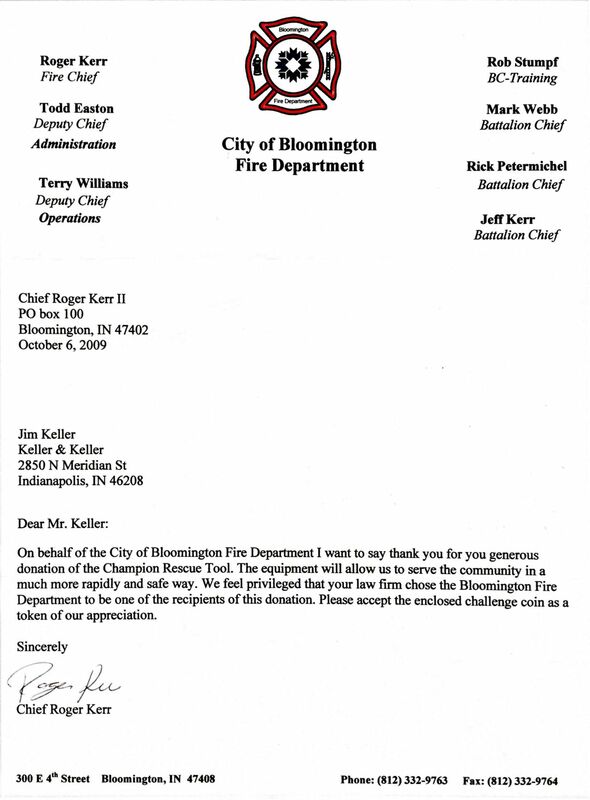 Fortunately, our new relationship with the rescue tools manufacturer put us in a position to fill a critical need for Bloomington's first responders. Keller & Keller's involvement with Hillel at Indiana University dates back several years and continues through the present. The organization is dedicated to providing a home away from for IU's Jewish students, enabling them with an opportunity to sharpen their leadership skills and stay connected to their history and culture in a traditional and creative setting. Jim Keller currently serves as IU Hillel President. 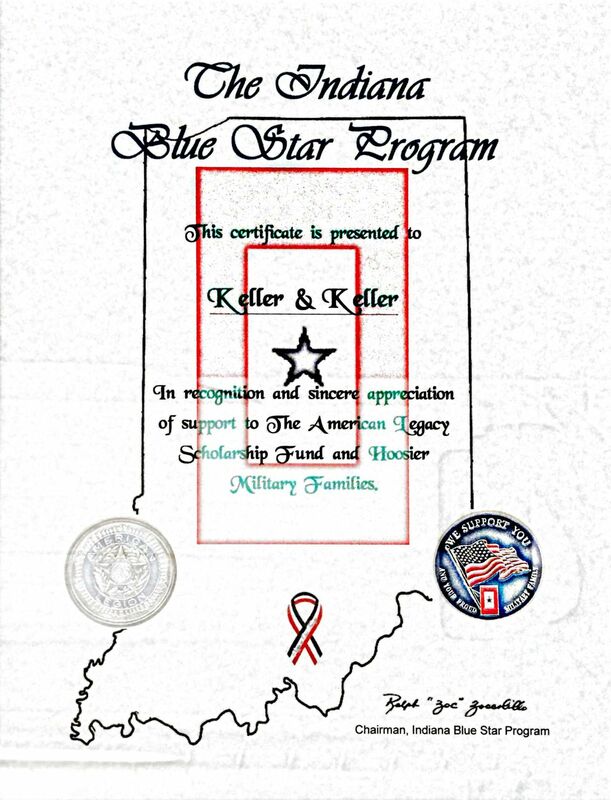 Having helped veterans receive their disability benefits over the past several years, our support of the Indiana Blue Star Salute gave Keller & Keller the opportunity to join Hoosier veterans and their families during an annual celebration of our service members' many sacrifices and commitment to our country. Traditionally, the Blue Star Service Banner dates back to World War I and was used by parents to indicate that they had a 'child' who was serving in the armed forces.Today, the Blue Star can still be seen hanging in the front window of homes across the United States, however, it now signifies that a 'family member' is serving overseas. 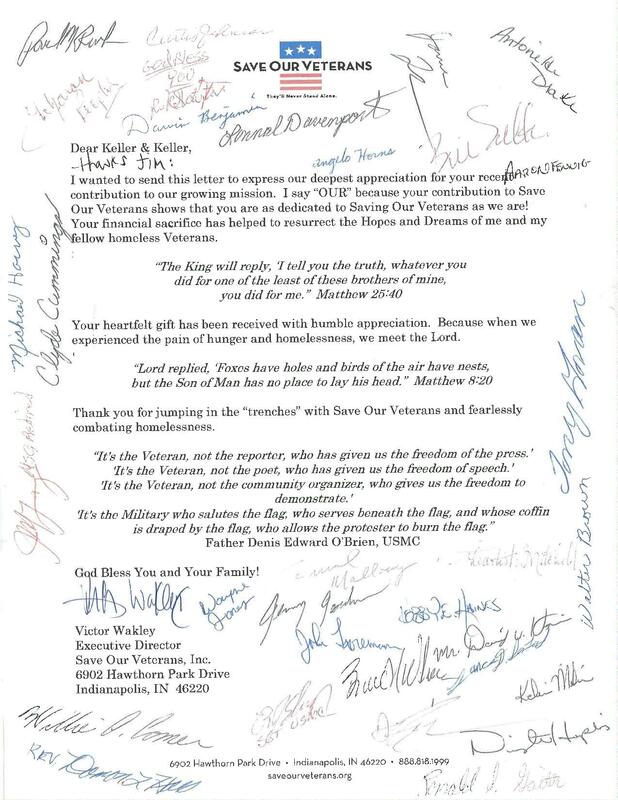 A local Indiana 501c3, the goal of Save Our Veterans is to empower our veterans by providing job skills training as well as housing opportujities for homeless vets. Since 2013, Keller & Keller has partnered with the University of New Mexico's School of Law to provide $10,000 in scholarship money to first-year law school students. Ultimately, three students were selected from a pool of applicants and awarded with a scholarship to further their pursuit of obtaining a law school degree. Currently, Keller & Keller is working to expand our educational scholarships and awards program to include additional universities and high schools in Indiana and Michigan. Meet the past recepients of the scholarship here: 2013, 2014, 2015, 2016. Posted on 05/22/2014 Keller & Keller Gives Back To The Community!